Even as its application to start a commercial bank is pending, India Post has drawn a massive plan to install as many as 3,000 ATMs and 1.35 lakh micro-ATMs at the ubiquitous post offices across the country for savings account holders by September 2015, a top official has said. "We will be starting with three ATMs to be installed in New Delhi, Chennai and Bangalore on February 5 and then ramp it up gradually," postal department secretary Padmini Gopinath told a select group of reporters here over the weekend. She said 1,000 ATMs with the India Post branding will be put in within the first year, which will be ramped up massively to 3,000 in the next 18 months. To start with, the ATMs can be used only by 26 crore savings account-holders who save with the postal department, but Gopinath exuded confidence that within six months of the launch, they will get the interoperability permission from the Reserve Bank. Postal savings are worth around Rs 6.05 trillion, which is half the savings in the largest lender SBI and more than double that of the largest private sector lender ICICI Bank. 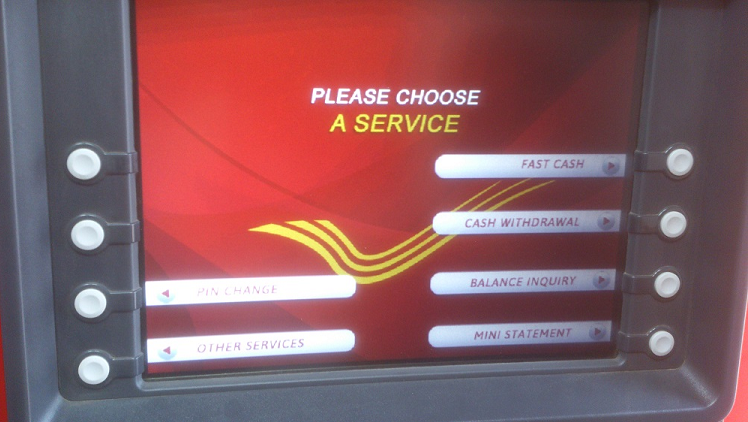 Through interoperability, India Post will join the National Financial Switch, which will benefit India Post account holders to transact at the banks' ATMs and vice versa, she added. India Post has been working with software major Infosys on this project, she added. The micro ATMs will be handheld devices to be operated at the post office level while the ATM will be similar to the one operated by any commercial bank, she added. The postal department, which has 1.55 lakh post offices over 90 per cent of which are in villages, offers the savings account to people across the country and pays an interest of 4 per cent per annum for such deposits. The account offers cheque facility at present. It can be noted that the Department of Posts is fighting a very contentious battle to convert itself into a full fledged bank, asserting that its reach can help achieve the goal of financial inclusion. However, the finance ministry has expressed some reservations about the idea, while Telecom Minister Kapil Sibal has exuded confidence of winning over his Cabinet colleagues to get the go ahead for the 'Postal Bank'.